British singer-songwriter Robbie Williams released his new compilation album “Under the Radar Vol. 3” on February 14, 2019. The album comprises 14 tracks including the two singles "I Just Want People to Like Me" and "Gold." The album is the final version of a trilogy, in which he already released "Under the Radar Vol. 1" and "Under the Radar Vol. 2" in 2014 and 2016 respectively. From the album, he has shared a new animated music video for “The Impossible,” directed by Stefano Bertelli. It was written by Robbie Williams, Leo Ferre and Guy Chambers. In the clip, he saves a small ship from some troubles like God. Robbie Williams will launch a headline show at Encore Theater in Las Vegas from March 6th through to July 6th. After Las Vegas shows, he will appear on BST Hyde Park on July 14th. Robbie Williams "The Impossible" was made by paper in stop motion animation. 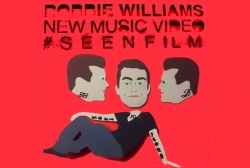 Robbie Williams has chosen Italy to shoot the videoclip of his new single, entitled "The Impossible." To realize and direct the video for the song off the new album for the British singer, "Under The Radar Vol. 3," Director Stefano Bertelli adopted the technique of stop motion animation using only original paper models and using minimal computer graphics. Production time was only 20 days. The studio has already made videos in the past for international bands such as lovelytheband, Amy Lee, The Shins, The Dead South, Vessels and The Flaming Lips. The director has only made videos by paper for many years.